Business investment in Wales is being "paused and cancelled" due to Brexit uncertainty, a Welsh minister has said. Ken Skates said an unnamed manufacturer has put on hold investment in north-east Wales "because of Brexit". The minister said the investment, which would create 250 jobs, "will be lost" in the event of a no-deal Brexit. He said ministers could possibly spend money on school and road building projects "to stimulate economic growth" if the UK leaves the EU without a deal. A no-deal Brexit would have "catastrophic consequences" for the Welsh economy, according to the minister. Mr Skates was responding to a report by the public spending watchdog that has warned that some parts of the Welsh public sector have only made limited plans for a potential no-deal Brexit. 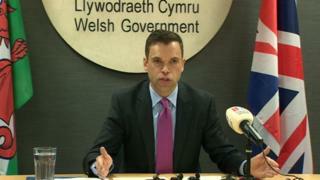 The Wales Audit Office (WAO) said councils in particular have not spent money because of the political uncertainty. The UK is set to leave the EU on 29 March - with or without a deal. Speaking at the Welsh Government's weekly briefing session for journalists, economy minister Mr Skates said: "Brexit is less than 40 days away and after two years of deep uncertainty, we are seeing investment decisions paused and cancelled and opportunity costs to due to the inactivity and uncertainty of this UK government. "We are certainly investing in where we can to promote business resilience, for example we've got the business resilience fund that has proven to be incredibly popular. "We are also insuring that we scan for opportunities to make the economy of Wales more resilient post March 29th looking at how we can use our capital investments in infrastructure, social infrastructure such as 21st century schools, hospitals, road investments to stimulate economic growth. "But the fact remains in the event of a no-deal Brexit our economy would face catastrophic consequences and could shrink by 10%. "Even with the prime minister's own Brexit deal the economy would shrink and we would face great difficulties so that's why our position remains that no-deal should be taken off the table," he added. He spoke as Brexit Secretary Stephen Barclay updated the UK Cabinet on talks with the EU's chief negotiator, Michel Barnier. The meeting, on the issue of the Irish backstop, was described as "productive" but Mr Barnier "expressed concerns".